Visitors to the SFA planetarium in the Cole STEM Building now have more opportunities for scientific discovery with the addition of two new planetarium shows, starting Dec. 15. Public shows are offered every Saturday with group shows available throughout the week upon reservation. NACOGDOCHES, Texas - Stephen F. Austin State University's planetarium in the Cole STEM Building will begin offering new shows Dec. 15, providing audiences with additional opportunities for scientific discovery. 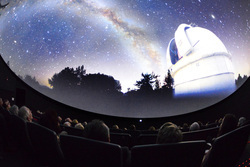 With public shows every Saturday and group shows available throughout the week upon reservation, the planetarium provides a wide range of subjects sure to interest any visitor. New shows will be offered Dec. 15 through Jan. 26, with a break Dec. 23 through Jan. 6 for the holidays. Presented at 3 p.m., "The Secret of the Cardboard Rocket" is geared toward children ages 5 to 8 but is open to all ages. Tickets are $3. "In this adventure-packed journey through the solar system, you will experience flying through the rings of Saturn, a lightning storm on Jupiter and a landing on the dwarf planet Pluto," said Ed Michaels, planetarium director. "This is a great children's show that explores the spectacular worlds of our solar system." Two additional shows will be offered. "The Secrets of Gravity - In the Footsteps of Albert Einstein" lets audiences travel space and time while uncovering the secrets of gravity and will be presented at 4:30 p.m. "Dark Universe," a show examining deep space, dark matter and dark energy, will be presented at 7 p.m.
Tickets are $6 for adults and $4 for children, students, and faculty and staff with ID and will be available for purchase at the planetarium box office 30 minutes before each show. To learn more about the shows offered, view the schedule or make a reservation, visit planetarium.sfasu.edu/home.